Illingworth St Mary’s suffered a first Division One defeat of the season, in their 11th outing, by the smallest possible margin at Clayton yesterday. Luke Brooksby took six for 51 as Clayton posted an inadequate-looking 183 with No 8 Jeremy Robertshaw’s 29 the top score. However, the visitors knew they had a game on their hands shortly after tea when Sam Wilson and Matthew Roe reduced them to 9-4 with the numbers two to five batsmen all departing for ducks. Opener Callum Cook (45) was still there and the middle to late order batsmen chipped in to set up a tight finish. However, league side bowler Wilson claimed his fifth victim and his side’s 10th wicket when he trapped the luckless Brooksby leg before for 31 with the total on 182. Stones had a welcome first win of the season when they beat fellow strugglers Queensbury at Swift Cross. William Thickett (87 no) and Scott Sutcliffe (67) added 125 for the fourth wicket to pave the way for a 249-8 total. Opener Jack Richardson (55) led the Queensbury response but he became one of six victims for Gregory Baldwin as the Ripponden side won by 22 runs. Great Horton PC trimmed Illingworth’s lead to eight points with Richard Hassall (4-30 and 104 no) their star man in a win at Blackley. Tom Baxter (80) and Adam Turner (54 no) helped the hosts to 247-8 but a 140-run opening partnership between Hassall and Amaar Syed (77) took Chapel a long way towards a five-wicket win. Bradshaw’s batsmen appear to have been on a go-slow at Sowerby Bridge, labouring to 111-9 in the face of what must have been tight bowling from Ashton Richardson, Jake Dixon and Steve Shannon, who each picked up three inexpensive wickets. Bridge wrapped up a six-wicket win in 28 overs. Division One: *Blackley 247-8 (Baxter 80, Turner 54*, Hassall 4-30), Great Horton PC 249-5 (Hassall 104*, Syed 77): pts 4-11. *Clayton 183 (Brooksby 6-51), Illingworth St Mary’s 182 (Cook 45, Wilson 5-72): pts 12-6. Bradshaw 111-9, *Sowerby Bridge 113-4: pts 2-11. *Stones 249-8 (Thickett 87, Sutcliffe 67), Queensbury 227 (Richardson 55, Baldwin 6-78): pts 12-5. Points (after 11 games): Illingworth SM 110, Great Horton PC 102, Clayton 96, Sowerby Bridge 90, Bradshaw 78, Blackley 60, Queensbury 42, Stones 36. 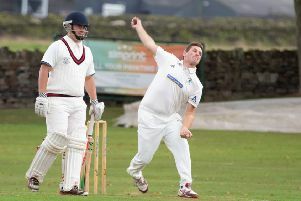 Cullingworth cut it fine but finally got off the mark for the season with a one-run win at Bradley & Colnebridge. Steve Welch (78 no) and Dave Robinson (5-32) were the heroes of a victory which lifted them above Greetland at the foot of the table. Welch batted through the visitors’ innings, which was concluded on 133. Phil Poole claimed three wickets before Robinson got in on the act with the total on 23 and Yasir Arfat’s efforts to pull the game out of the fire for Bradley with 64 narrowly failed as Robinson cleared up the tail. Resurgent Old Town will have enjoyed their 41-run derby win at Luddenden Foot and they are now only seven points behind their hosts in third place. Town can’t have topped 350 too many times but they made 353-6 at High Lea Green with Sagher Shaheen (106) and Adil Hanif (81) to the fore. Isaac Baldwin (77) led a robust Foot response and there were also half-centuries for Joel Cleary, Charlie Holt-Conway and Ryan Allen but the asking rate was too great and the hosts finished on 312-5. Greetland dropped to the bottom after leaders Mount piled up 342-6 at West Vale. Mahmad Kayat (103 no), Rizwaan Abed (67) and Mahmad Gheewala (50) made the most of the continued good batting conditions. Damien Reynolds was in no mood to lie down, however, and he hit 137 in Greetland’s 252. Runs were harder to come by at Leymoor, where Low Moor HT lost by 60 runs. The visitors’ Bradley Osborne had the game’s top score - 45 - but his side bowled 25 wides and paid the price. Mark Coulson clearly bowled much straighter for the hosts, taking five for 43 off 15, as Leymoor defended a total of 219. Outlane dented the promotion ambitions of Upper Hopton with a 106-run home win. 62), Upper Hopton 144 (Croft 5-33): pts 12-4. Points (after 11 games): Mount 104, Luddenden Foot 94, Old Town 87, Upper Hopton 85, Leymoor 79, Bradley & Colnebridge 74, Outlane 67, Low Moor 66, Cullingworth 34, Greetland 31.